Are you a Broadway show fanatic or simply a music lover by heart? 'Tis the day to be merry! 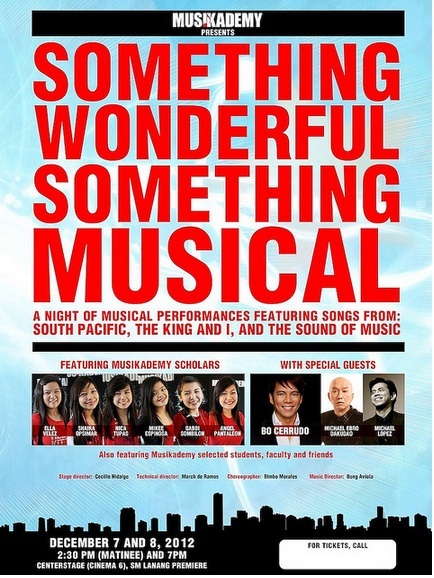 Musikademy, Davao City’s premier vocal music school brings the broadway show, "Something Wonderful Something Musical." Something Wonderful, Something Musical will feature musical performances of talented local artists and special guests from Metro Manila. The show is adapted from the three broadway hits: South Pacific, The King and I, and The Sound Of Music live on December 7 & 8, 2012 at SM Lanang Premier's Centerstage located at Lanang, Davao City. It will have two shows for the said dates, one at 2.30 pm (Matinee) and the second at 7 pm ( Gala). Wow. This is cool. The song choices are beautiful. one music lover typing here! whew, I wish I could be there! Music is really a big part of Filipino culture isn't it? That's one thing I miss! Songs from The King and I, and The Sound of Music? Wow! Two of my all-time favorite movies.. I enjoy watching musicals. I watched one in Broadway last year, something about Beatles. I didn't like Beatles but I had fun watching the whole show and had to sing a long too. This will be a night to remember in Davao. Wish I can be there too! i'm not but my girl is! wish to bring her watch musicals like King & I. it would be a great experience for her. Wow how I wish to attend this event with my daughter as she would enrol herself in music specifically guitar or piano. How I wish we will not be very busy this sat. I dig this type of musical presentation. Sad lang 'cause I can't make it there. Sana mag-perform din ito sa CCP. This musical is really interesting. I just hope I have time to watch this.